Dr. Guofan Shao is currently a full professor of Geo-Eco-Informatics, Department of Forestry and Natural Resources, Purdue University. Dr. Shao completed his undergraduate and graduate degrees from Northeastern Forestry University, China in 1982 and 1985 respectively. 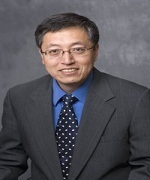 Dr. Shao earned his PhD in Ecology, Chinese Academy of Sciences in 1989. Before joining Purdue University, Dr. Shao was Research Scientist, Department of Environmental Sciences, University of Virginia, USA (1994-96) and Research Fellow, John Kennedy Space Center, NASA,USA •(June 05 – Aug 05). He has over 127 refereed publications, 19 Book chapters and 6 Books.